Ken MacLeod is a son of the manse, or at least he is the son of a minister in the Free Presbyterian Kirk. He is also a graduate of the innumerable turf wars that have interminably affected the different sects of the political left. He is, therefore, thoroughly familiar with belief in all of its aspects. 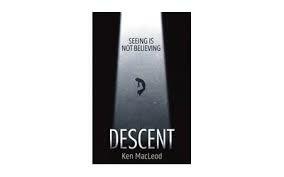 And Descent is, above all, a novel about belief. Oh it pretends to be a novel about UFOs (more convincingly in some places than in others), but the whole paraphernalia surrounding unidentified flying objects, from lights in the sky to alien Greys to abductions and sexual probes and Men In Black, is just one more iteration of our need to believe. It matters not one jot whether any of these belief systems might be true; in fact, if any of them could be shown to be true or false they would cease to be a matter of belief. The shadows of belief, however, have an incredibly powerful effect on the way we live our lives, for good and ill, and this is a novel that explores just such an effect. It is not, it has to be said, one of the best novels MacLeod has written. It opens with a fairly conventional account of a UFO experience. The conventionality is, of course, part of the point, yet it still feels that this could have been written with rather more engagement and originality than is on display here. It is only in the last third of the novel, when technological and political complexity are added to the mix, that the book really starts to command our attention. It is worth the wait, though, for in the end we encounter the rich mix of ideology and characterization that are hallmarks of MacLeod’s work at its best. We begin in the near future, immediately after some sort of political or economic revolution that has saved the world, though the imprecision of all of MacLeod’s references to this event add to a sense of woolliness throughout the book. Ryan and his best friend Colum are nearing the end of their school careers in Greenock (is it just because the book is dedicated to Iain Banks that we see echoes of MacLeod and Banks in this relationship? ), when a ball of light falls upon them from the sky. They come to some time later, dazed but otherwise unharmed, but Ryan, our narrator who seems very suggestible, is convinced that they had a close encounter with a UFO. This impression is confirmed a few days later when he has a strange visit from a creepy clergyman called James Baxter who has the classic appearance of a Man In Black. Baxter reappears a few years later, again dressed as a clergyman, to have a long strange conversation with Ryan at his university, including giving him advice to study Divinity despite being an atheist. In fact the numerous discussions about religion are among the liveliest and most interesting scenes in the early part of the novel. More years pass, Ryan is now a freelance science journalist, and Baxter appears for a third time, but now he is a charismatic right-wing politician who once worked for an aerospace company. At last, the story starts to come into focus, though there is still a little way to go before the whole enterprise really starts to take off. Part of the problem is that there is simply too much going on in the book, as if MacLeod was aware that the UFO plot was too conventional to sustain a novel and kept adding subplots to try and liven it up a bit. Some of these, the relationship with Calum and his ancient family, the love affair with schoolfriend Sophie that never seems to get started, work very well; others, such as the notion that the human race is dividing into different species that cannot interbreed, seem to have wandered in from a completely different novel and don’t really seem to belong here. But it is only when the UFO story is pushed into the background to make way for a tale of ambiguous technological innovation and complex political machinations that the book really takes off. As ever, MacLeod is at his best when describing moral ambiguity: people acting badly for the best of reasons, situations in which the good and the bad cannot be told apart. This only emerges from the rather bland ufology setting late in the novel. But when it does, all the belief systems we have seen in the novel are inverted, distorted, questioned, so what had seemed clear becomes confusing, and is all the better for it. In the end, Descent is a novel worth reading, but you can’t help feeling it would have been much stronger if the ambiguities at the end of the novel had been there at the beginning.